“Any man who can drive safely while kissing a pretty girl is simply not giving the kiss the attention it deserves,” Albert Einstein is purported to have said. The quote acknowledges a fundamental characteristic of human attention. Sometimes there simply is not enough of it to go around. Never mind the buzzes and beeps of every new text message and e-mail, distracting as they may be. The pressures to be supportive family members, lifelong learners, chiseled athletes and professional leaders make multitasking nearly irresistible. You can almost hear our collective inner monologue: there must be a way to trick time, to coerce that lengthy to-do list to start shrinking twice if not three times as fast. Yet effective multitasking is a myth. So, too, is the idea that members of the “multitasking generation,” who grew up with video games, smart phones and e-readers, can somehow concentrate on several things at once. 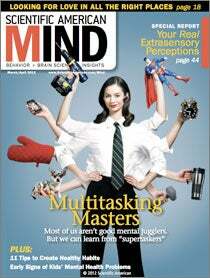 In fact, research indicates that frequent multitaskers are often the worst at it.